The San Diego region would reap billions of dollars from a “frictionless border” that encouraged economic development rather than focusing on security, according to a study released Thursday. 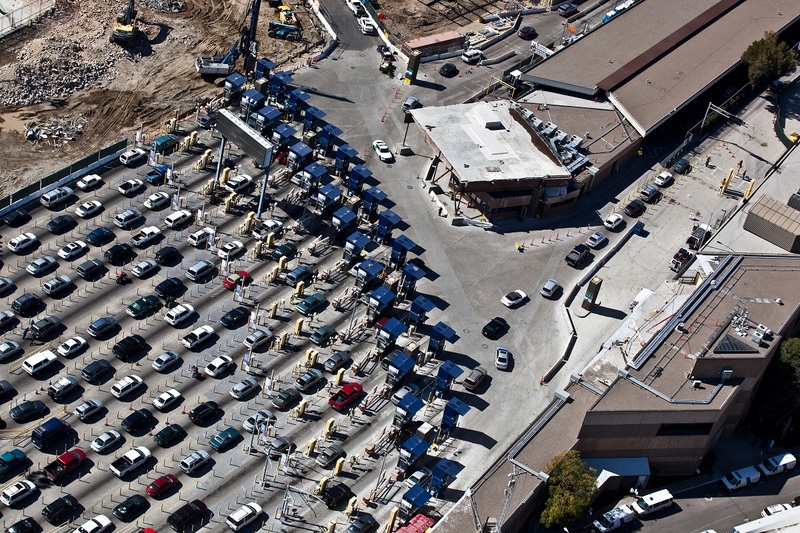 Cars line up at the U.S. Customs and Border Protection inspection station at the San Ysidro Port of Entry, thought to be the busiest land port in the world. Photo by U.S. Customs and Border Protection. The study, led by Florida’s group in partnership with Global CONNECT at the University of California, San Diego, found that billions of dollars of economic opportunity are being lost due to a narrow definition of the border as exclusively a homeland security issue. Losses from “narrow policy objectives, antiquated infrastructure and border management between San Diego County and Baja California” were estimated at $2.9 billion in foregone output and 40,000 jobs in the two regions. For the U.S. and Mexican economies as a whole, the loss was put at $7.2 billion and 62,000 jobs. The researchers met with dozens of business, community and government officials on both sides of the Tijuana-San Diego border to hear their personal stories and vision for a frictionless U.S. and Mexico border. “The key to fully maximizing the potential of the border will require us to integrate economic, social and cultural objectives into border policy,” stated Mary Walshok, associate vice chancellor and extension dean at UC San Diego and a co-author on the report. Private sector involvement in all of the above. The full report “From Border Barriers to Bi-National Promise” is available online.